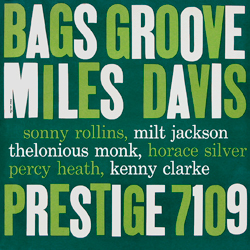 Bags' Groove is a jazz album by Miles Davis, recorded in 1954 for Prestige Records but not released until 1957. Both takes of the title track come from a session on December 24, 1954 ("Bags" was vibraphonist Milt Jackson's nickname). The rest of the album was recorded earlier in the year, on June 29. The other tracks recorded during the December 24 session may be found on Miles Davis and the Modern Jazz Giants. All of them are also featured on the compilation album Thelonious Monk: The Complete Prestige Recordings.